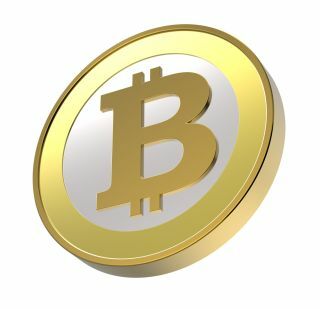 The Bitcoin symbol resembles a dollar sign with a double-barred letter B.
Bitcoins soon may go off the grid and into space. One private venture is aiming to launch a cluster of tiny satellites that would broadcast the latest bitcoin transactions from orbit. "To me, it's really about resilience and lowering costs," Jeff Garzik, the man behind the start-up Dunvegan Space Systems, told Space.com. This week, Garzik announced that his company contracted the private space venture Deep Space Industries, Inc. to develop nanosatellites for the project dubbed BitSat. Bitcoins are a decentralized, digital-only currency that is managed through a peer-to-peer network of computers on the ground. This network maintains transactions and makes new bitcoins through an esoteric process called mining. Having the latest bitcoin data broadcast from a constellation of satellites could be useful if there is a localized Internet outage, though Garzik cautions that the BitSat project is not intended as a backup in case the entire terrestrial network fails. Primarily, Garzik hopes the BitSat network will have a democratizing effect, making bitcoin data available to people living in off-grid locations or outside Western nations in places where an Internet connection is costly. "If you're paying for internet bandwidth, that can impose a real cost on users," Garzik said. "That may prevent some users form using bitcoin." Deep Space Industries launched just last year with big plans to prospect near-Earth asteroids and mine them for water and metals. Deep Space chairman Rick Tumlinson, a veteran of the private space industry, said the company's move into the cryptocurrency world is in line with its goals. "While this announcement may surprise some people, it is actually very much in line with our spacecraft development plans, including another private spacecraft system we will be announcing in a few months that will use many of the same components and systems," Deep Space chairman Rick Tumlinson said in a statement. "This means much lower costs — very important for the donation-based BitSat effort." Under the deal (which Garzik characterized as less than US $100,000 in value, though the payment was in bitcoins), Deep Space Industries is responsible for developing the requirements for the space and ground segments of a BitSat constellation, as well as plans for the architecture, operations concept and spacecraft design. Garzik has a fundraising target between $2 million and $5 million to get the first BitSats off the ground. He's hoping to raise those funds (in bitcoins) through a Kickstarter-like campaign. The deal isn't the first time bitcoins are crashing the space industry. British billionaire Sir Richard Branson recently announced that his commercial space company, Virgin Galactic, would start accepting payments in the cryptocurrency for suborbital flights aboard SpaceShipTwo. So far, the Winklevoss twins — famous for their dispute with Facebook founder Mark Zuckerberg — are among Virgin Galactic's bitcoin-paying customers.